It's been a hot minute since I reviewed more Darling Girl lip products so let's take a peek at the Sparkle Matte-ic Lip Tints today, sparkly versions of the popular Pucker Paints! 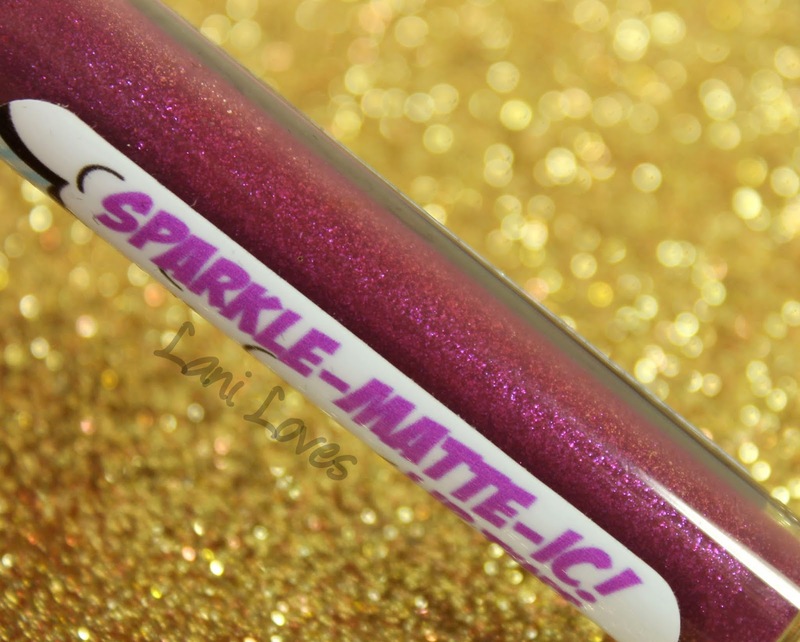 There are currently four shades available, ranging from berry and pink tones to a cool blue-grey. Sparkle Matte-ic Lip Tints are a spin on Darling Girl's Pucker Paints; the same bold, ultra matte finish with a tonne of sparkle. The combination is dazzling, but doesn't always make the formula the easiest to work with. 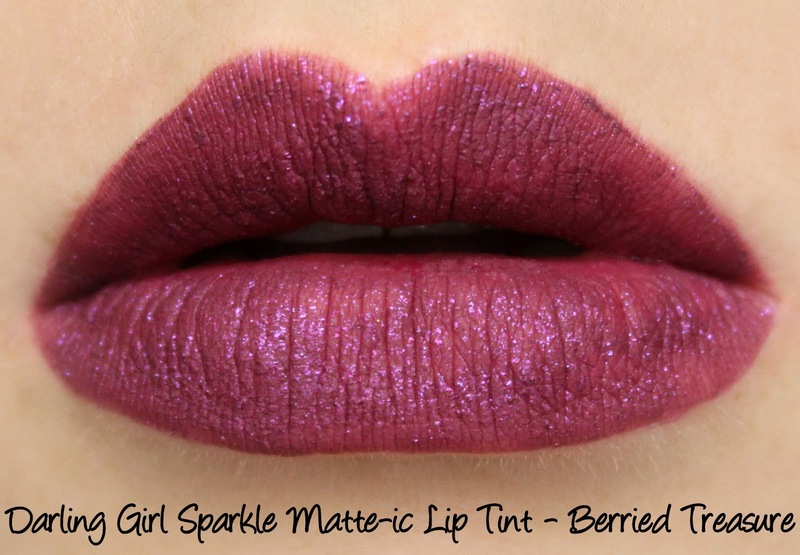 To bring out the sparkle effect, you need to press your lips together (it should be noted that this is a necessary step with any glittery matte lipstick, not a Darling Girl-specific quirk) but this can sometimes disrupt the evenness of the base colour (more noticeably with Berried Treasure and Galactic Love Story). It seems to be more of an issue where the base colour is already on the sheerer side to let the stronger sparkle show, requiring multiple layers for opacity. 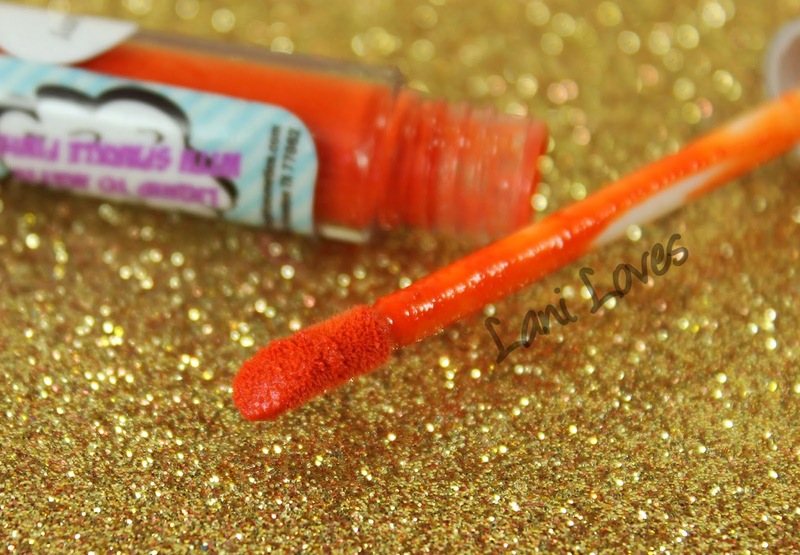 It's certainly not true of all the shades; the limited edition colour Vampire Barbie, which I reviewed a while back had no such issues, nor does Dreamy in this batch of reviews. It's crucial to leave a few minutes between layers and let the lipstick fully set before gently pressing your lips together a few times. 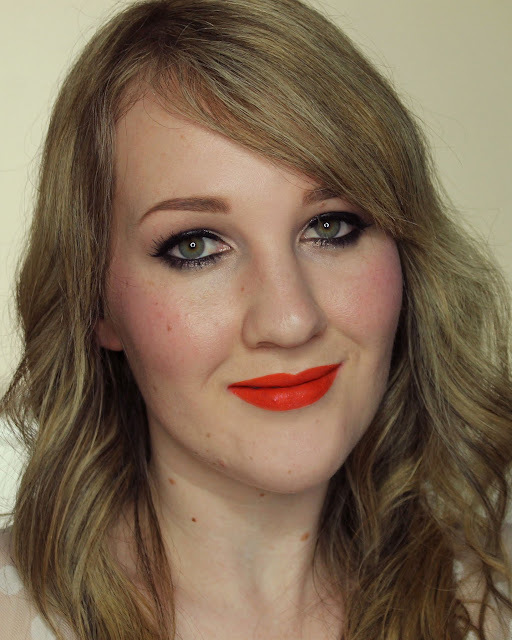 Whether the effort is worth it is really up to you - I love these colours and the final effect, but will probably layer them over co-ordinating lip liners next time I use them so that I'm not relying on the base colour to provide all of the opacity. 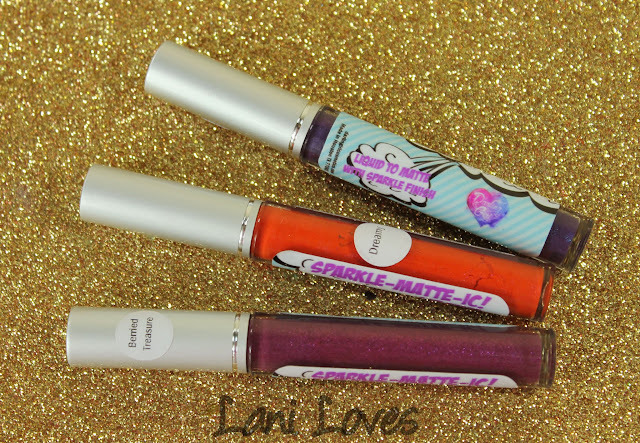 The packaging for the Pucker Paints has changed since I bought these, so I'm assuming the same can be said for the Sparkle Matte-ics. 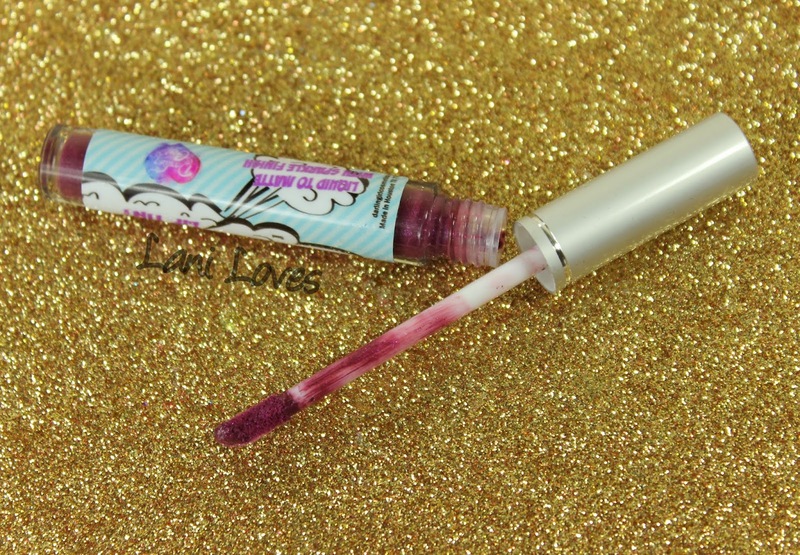 You can see the new Pucker Paint packaging here, but the gist is the same; a slim tube with a doefoot applicator that's nice and easy to control. Berried Treasure (permanent) is a medium berry-fuchsia shade with blue holo sparkle, though the sparkle shows up more purple when mixed with the berry tones. 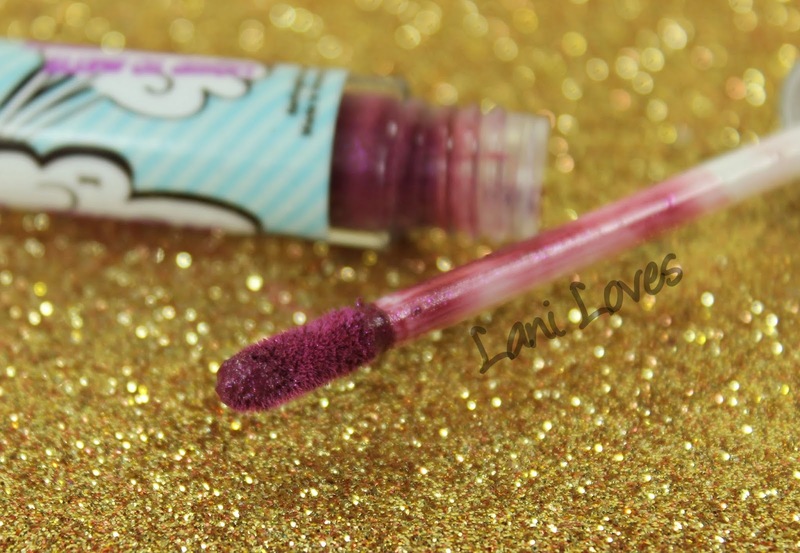 The more you press your lips together, the more sparkly it becomes, yet the colour becomes more uneven at the same time so it's a bit of a trade off, although any application flaws are not really noticeable from normal viewing distance. Berried Treasure lasted a bit over five hours on me and was not drying. 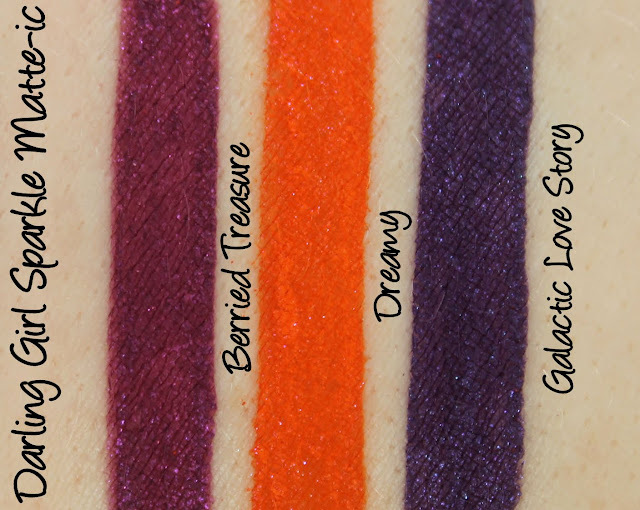 Dreamy (discontinued) is a bright orange with purple holo-sparkle. It is somewhat chalky, although my photos don't properly show it, but it's such a gorgeous colour, I find it hard to hold that against it! 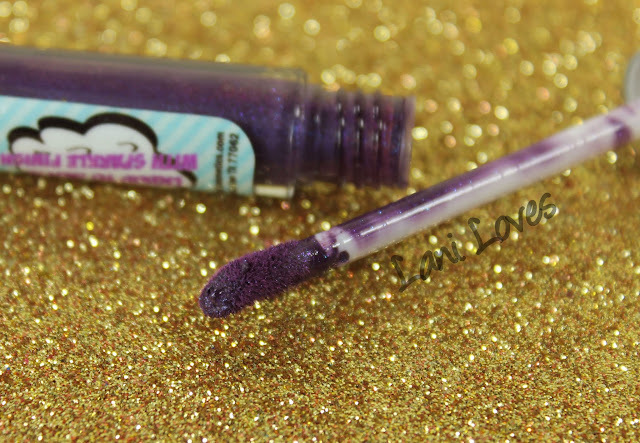 Dreamy applies smoothly and wore for seven hours on me, becoming slightly clingy towards the end of wear. 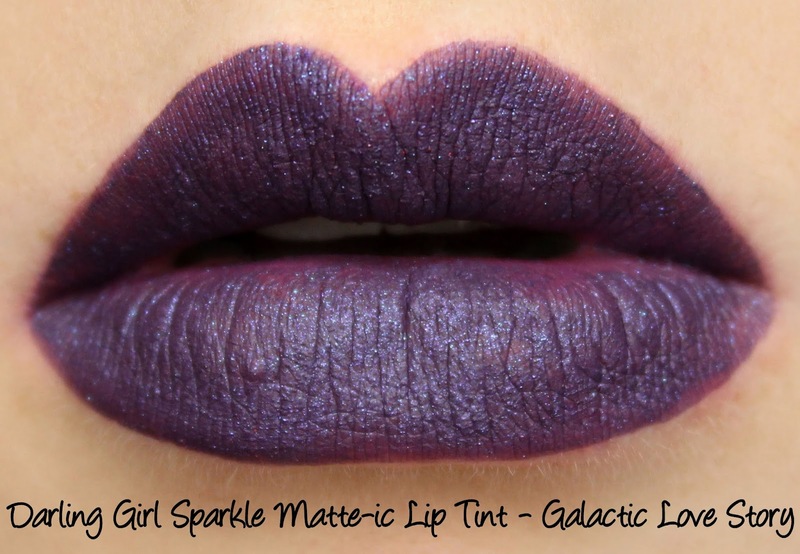 Galactic Love Story (possibly discontinued) is a dark purple with blue sparkle. 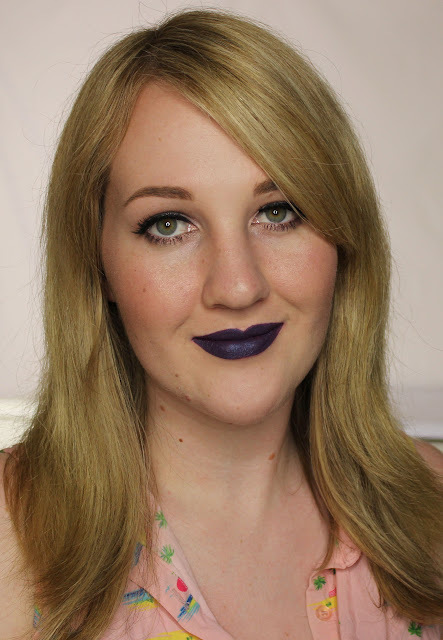 This shade stains hot pink strongly and very quickly, which is a common theme with purple lipsticks, and particularly liquid ones, I've found. 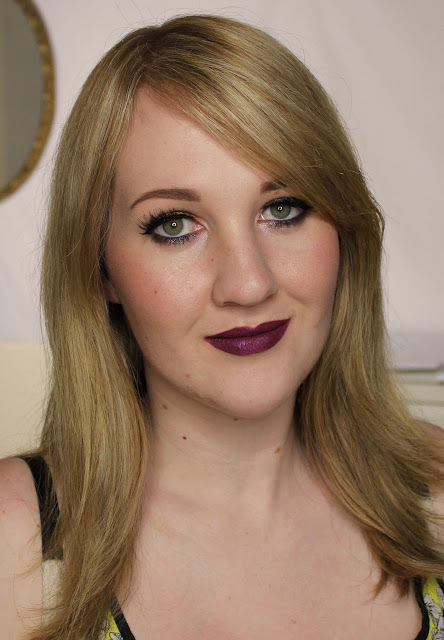 Even where the colour isn't completely opaque on my lips, the stain has still taken hold and shows through the lipstick, which is somewhat annoying, but as I mentioned, it's certainly not an issue unique to Darling Girl. Galactic Love Story doesn't present the easiest application, it's necessarily sheer to show the shimmer and requires patience and multiple layers to build it up to the state you see above. For that reason, it's been discontinued and may possibly return after reformulation so if you love the colour make your voice heard in the Darling Girl Glitter Haven Facebook group! Despite its flaws, I really do love Galactic Love Story and think the total bad-assery of the colour is well worth the fuss. It lasted five hours on me without being drying. Wear time was between five and seven hours. Darling Girl Cosmetics, $11.75USD - you can use my code LANILOVES for 10% off your order! 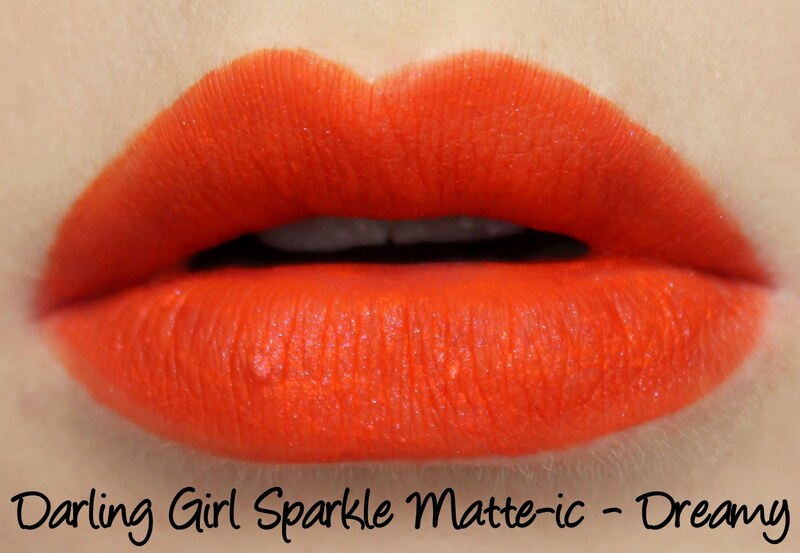 Have you tried Darling Girl's Sparkle Matte-ic Lip Tints?